Background: Training of postgraduate students has traditionally been done in person in a hospital setting with hands-on training with each faculty member imparting knowledge to 2 to 4 students per year. Supplementing their practical education with online instruction could make a significant difference in standardizing pediatric cardiology education in India. Objective: To present the rationale, methods and survey results of a live e-Teaching methodology implemented for Pediatric cardiology trainees in association with the National Board of Examinations, India. Materials and Methods: Between March 2010 and March 2014, 310 e-classes were conducted in the Pediatric cardiac sciences by 24 e-teachers. Content of the e-Learning program was based on a 2-year pediatric cardiology curriculum and included twice-weekly live online video training sessions, a library of recorded sessions and online test quizzes for the students. A total of 231 students accessed the program at various times over the 4-year period. Results: In our study, requests for access to the e-lectures increased from 10/year the first year to 100/year by the fourth year with feedback surveys conveying a high satisfaction level from the students and a high need for this knowledge. The advantages of virtual live e-Learning included the fact that one teacher can teach multiple students in multiple geographic locations at the same time, obviating the issue of quality teacher shortage and the same content can be disseminated to all students undergoing specialist training so there is a national consensus on diagnostic and management approach among all trainees. Additionally, the e-classes can be recorded and replayed so they can be viewed repeatedly by the same group or new trainees. Conclusion: This is the first sustained use of e-Teaching in a medical super-specialty in India. We believe that e-Teaching is an innovative solution that can be applied, not just to Pediatric Cardiology as we have done, but to all branches of specialist and super-specialist medical training in India and globally. Congenital heart anomalies are the most common major birth defect in the world, , yet a large number of newborns with a heart defect live in regions where medical care is inadequate or unavailable. Increasing access to appropriate, quality pediatric cardiac care is a health care priority that many low- and middle-income countries face today. In India, few nationally accredited training centers for pediatric cardiology exist. Practitioners in India have identified significant discrepancies in the learning experience for pediatric cardiology and cardiology fellows across academic institutions,  particularly in terms of receiving structured and standardized education of theory and critical thinking. Traditionally, training of postgraduate students has been done in person in a hospital setting. While this remains invaluable in terms of hands-on training, the energy to output ratio per faculty member in terms of didactic training is low i.e., each faculty member imparts his or her knowledge to 2 to 4 postgraduate students per year, depending on the number enrolled in that institution. Supplementing their practical education with online instruction could make a significant difference in standardizing pediatric cardiology education in India. We therefore designed an e-Learning program to see if this could enhance the efficiency and efficacy of the Pediatric Cardiology training in India. The e-Learning program began as a pilot in March 2010 using a Cisco-based WebEx platform and funded by a Bangalore-based not-for-profit, People4People. Postgraduate students in Pediatric Cardiology from across India were invited to attend the e-classes on a voluntary basis at no cost and senior faculty members were invited to give e-lectures on a voluntary basis as well. 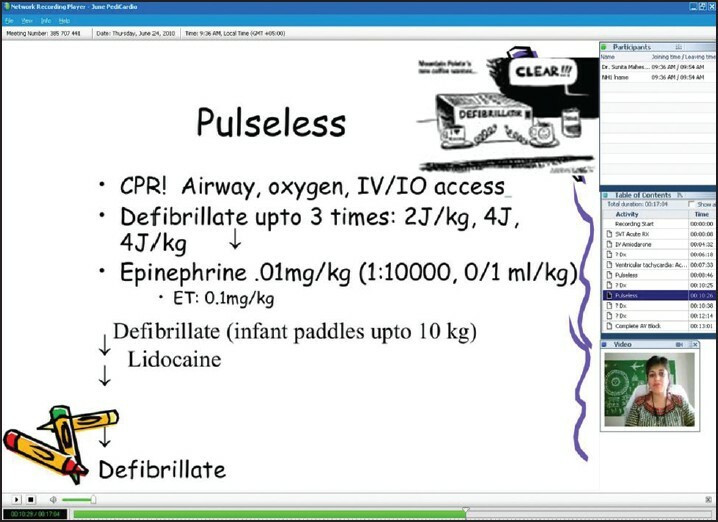 In January 2012, People4People, a nonprofit charitable trust in India, India's National Board of Examinations (NBE), the national body that sets standards for post-graduate medical education, and Children's HeartLink, a nongovernmental organization dedicated to improving access to pediatric cardiac care in resource-constrained countries, introduced an innovative online platform delivering e-classes to supplement the education for cardiology and pediatric cardiology fellows in India. The platform allows for storing and viewing of previously recorded e-lectures as well as administration of quizzes that could test the postgraduate students on topics delivered. The technology can also provide data on the number of students who actually visited the portal and reviewed recorded e-lectures. At this point, Children's HeartLink received funding for the program through the Medtronic Foundation to cover costs associated with planning, staffing and student use of the platform. Content of the e-Learning program is based on a 2-year pediatric cardiology curriculum and includes twice-weekly live online video training sessions, a library of recorded sessions, didactic reading and interactive materials, homework assignments, quizzes and tests and collaborative forums for faculty and students. Topics range from how to read an electrocardiogram to more complex topics such as isomerism. The e-classes are provided free of charge to all students from low- and middle-income countries and a nominal fee is asked from interested students from high-income countries. A schedule of upcoming classes is emailed to the students each week. Students can access the live e-classes on their laptops, computers or iPhones with a minimum bandwidth speed ideally of 1mbps. Faculty members are requested to make the lectures interactive i.e., with question and answer (Q and A) slides rather than purely didactic. Interspersed and at the end of each structured e-lecture are random Q and A i.e., quiz format sessions. Students can type in their answers in the chat box provided on the platform. In October 2012, the National Board of Examinations (NBE) in New Delhi made attending the e-lectures by Fellow of the National Board (FNB) students in Pediatric Cardiology mandatory. Results of the knowledge assessment quizzes based on the e-lectures given are now made available to the NBE bi-annually. Feedback was collected from the students and faculty via online survey. Email feedback was also received from candidates who had completed their fellowship training. Between March 2010 and March 2014, 310 e-classes were conducted in the Pediatric cardiac sciences. Twenty-four e-teachers from India and other countries generously donated their time and knowledge. Apart from the mandatory FNB students (13-15 new students each year), several interested students and practitioners globally requested access. A total of 231 students accessed the program at various times over the 4-year period. While most of the attendees were from India, 47 were international attendees, from countries such as Bangladesh, Saudi Arabia, Kuwait, Australia, Mauritius, Costa Rica with the majority being from different countries in Africa. Quiz results of the FNB candidates are forwarded to the National Board of Examinations, allowing for formal assessment of their understanding of the content delivered. In a recent online survey [Table 1], a total of 25 responses were received, primarily from fellows in training or having recently completed training in Pediatric cardiology in India. In their responses students identified as the most positive aspects of the e-Learning the question and answer sessions, topical quizzes, and the ready access to experts and ability to interact with them. Over 90% of respondents said that the e-Learning program has had a large impact on their pediatric cardiac training. This included enhanced knowledge, increased motivation, improved practical skills such as diagnostic skills and understanding of pathophysiologic basis of cardiac lesions. In all, 75% of the respondents said the e-classes helped prepare them for the passing of their final exam. One student even went as far as to credit the program for his ability to pass his final exam. 96% felt they are more effective and confident in their professional role as a direct result of the e-Learning program while 84% felt that as a result of participating in the e-Learning program they have developed practical skills (which included the ability to interpret complex electrocardiograms, echocardiograms and angiograms) that they may not have otherwise acquired. Finally, all the respondents said that the e-classes have enhanced their knowledge of pediatric cardiac care and the e-Learning program has improved the quality of the training in the pediatric cardiology fellowship in India. In addition to the students' survey, a faculty survey was also conducted with 12 active faculty members responding to the survey. Seventy percent of the faculty felt the e-Learning program has enhanced the students' knowledge of pediatric cardiac care. Most faculty also did indicate they had seen improvement in the academic performance of the students because of the program. The majority of them felt unsure whether the students have developed practical skills as a result of the program. This may indicate that the classes need better integration with the students' practical experience and training. However, 67% felt the students were more confident and effective in their professional roles because of their participation in the classes and 78% felt the e-Learning program helped students prepare for their final exam. Some of the suggestions for improvement that the faculty put forward were increased interaction and discussions with the students and asking the students to present occasionally. Although the number of medical colleges in India has been increasing steadily, there is still an acute shortage of teaching manpower in the existing medical colleges. This shortage is in the region of 20%-25% in most departments and as high as 33% in some departments, based on data published in the National Medical Journal of India. The shortages are particularly acute at the postgraduate level. Number of trainers i.e., specialists interested in teaching is limited. Even if the trainers would like to focus on training, the amount of energy and time needed for clinical work makes content creation/class delivery a challenge. The quality is variable and different institutions have different protocols/approaches to patient care so there is no standard content necessarily taught across the country. The use of technology in specialty training is an innovative solution addressing these problems. The use of 'e' in training for specialists has been attempted via teaching websites and creation and distribution of DVDs/CDs. However, with direct contact between student and teacher lacking, it is non-interactive. A study in the UK evaluating e-learning material usage by students in the NHS system demonstrated that spoken and written reinforcement may be needed to increase use of e-learning materials. Senior postgraduate trainees were attracted by the ability to access materials at home in their own time and were open to the advantages of e-learning, to the point of accepting a requirement to complete e-learning modules as a formal element of their specialty training. However, it was clear that they prized the social interactions with peers and supervisors provided by study days and were not prepared to completely forfeit this aspect of their training. Our e-learning methodology included audio video and interactive sessions aimed at obviating these shortcomings of more traditional e-learning modules. Be easy to use to prevent students from dropping out. Work on inexpensive bandwidth, which is easily available. Be web-based so the teacher and student can log in from anywhere anytime and there is no need for students or teachers to go to any particular physical location to participate. Have the ability to demonstrate a PowerPoint presentation as well as a drawing board. Be recordable so classes can be replayed. Be interactive so question and answer sessions can be used during the e-classes. Our methodology and platform [Figure 1] were based on the above needs. The question and answer sessions are fully interactive and similar to a typical classroom. In our study, requests for access to the e-lectures increased from 10/year the first year to 100/year by the fourth year with feedback surveys conveying a high satisfaction level from the students and a high need for this knowledge. The limitations to this method of teaching include students not always being relieved from their clinical duties to attend the live e-classes. The ability to view recorded e-classes helped override this limitation. A criticism of this methodology is that it cannot replace hands-on training in the catheterization laboratory or echocardiography room. That is certainly true and this e-Learning module was intended to supplement, not replace traditional training methodologies. This is the first sustained use of e-Teaching in a medical super-specialty in India. We believe that e-Teaching is an innovative solution that can be applied, not just to Pediatric Cardiology as we have done, but to all branches of specialist and super-specialist medical training in India and globally. World Health Organization [Internet]. Geneva, Switzerland: Media Centre; Fact sheet N°370; Congenital Anomalies. 2014 [Last updated on 2014 Jan, cited on 2014 Sep 22]. Available from: http://www.who.int/mediacentre/factsheets/fs370/en/. Tandon R. Development of Pediatric Cardiology in India [Internet]. India: Pediatric Cardiac Society of India. Available from: http://pedicardiacsocietyofindia.com/files/Development%20of%20Pediatric%20Cardiology%20in%20India%20by%20Dr%20Tandon.pdf [Last cited on 2009 Sep 01]. Ananthkrishnan N. Acute shortage of teachers in medical colleges: Existing problems and possible solutions. Natl Med J India 2009;20:25-9. American Board of Cardiovascular Medicine [Internet]. Spring Hill: Cardiology Resources for MD, PA, NPs. Available from: http://www.accn.net/ [Last cited in 2014 Sep 22]. Smith S, Roberts N, Partridge M. What factors influence postgraduate medical trainee attitudes to computer-based learning? Internet J Med Educ 2009;1:2. [Last cited in 2014 Sep]. Available from:ispub.com/IJME/1/2/4119.